Henry and Priscilla Walters (sometimes written as Walter) of 1 Myrke Cottage, Datchet Road, received this letter, above, from their son’s commanding officer in October 1917. The Walters were a family of agricultural and general labourers who lived at The Myrke. 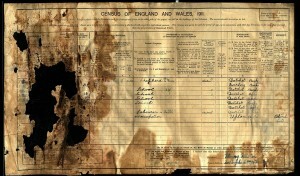 Henry, a shepherd from Datchet, and his wife Priscilla, née Hambleton, from Earley, were married in 1896. 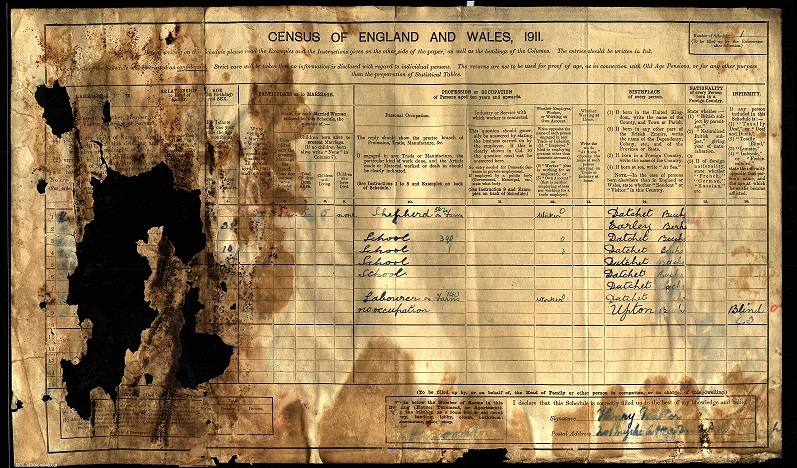 By 1911 they had five children, two boys and three girls. Thomas Henry Walters, their eldest child, had been born in Datchet in February 1898, and a sixth child, another daughter, was born into the family in 1914. After five months in France and Flanders, on 22 September 1917, Thomas Henry was killed in action, aged 19. The website, www.wardrobe.org.uk has a diary entry from the 2nd Wiltshires for the day Thomas died in the Belgian trenches: ‘Day marked by persistent shelling of area between Lumm Farm and the Messines-Wytschaete Road. A direct hit was obtained on a concrete dug out near the road where a Lewis Gun post had been established. Casualties for the day were 2 OR [ordinary ranks, ie not officers] killed and 6 OR wounded. Slight amount of gas shelling during the night. 2/Lt C V Deane joined from Rouen and posted to “B” company. 71 OR joined from Rouen.’ Thomas was one of the two men killed. 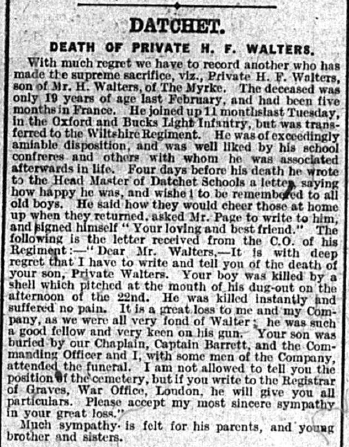 ‘With much regret we have to record another who has made the supreme sacrifice, viz., Private H F Walters, son of Mr H Walters, of The Myrke. The deceased was only 19 years of age last February and had been five months in France. He joined up 11 months last Tuesday in the Oxford and Bucks Light Infantry, but was transferred to the Wiltshire Regiment. He was of exceedingly amiable disposition and was well liked by his school confreres and others with whom he was associated afterwards in life. The Windsor & Eton Express also reported on 6 October 1917: ‘Four days before his death he wrote to [Mr Page] the Head Master of Datchet Schools a letter saying how happy he was and wished to be remembered to all the old boys. He said how they would cheer those at home up when they returned, asked Mr Page to write to him, and signed himself, “Your loving and best friend”.’ The letter would probably have arrived in the village around the same time as the news of Thomas Henry’s death. Unlike many of the men on Datchet’s WWI memorial, Thomas has a grave. He is buried at Torreken Farm Cemetery No 1, Wytschaete, Belgium, 7.5 kms south of Ieper (Ypres) town centre, on the road to Armentieres. Wytschaete (now Wijtschate) was taken by the Germans early in November 1914. It was recovered by Commonwealth forces during the Battle of Messines on 7 June 1917, but fell into German hands once more on 16 April 1918. The village was recovered for the last time on 28 September. Torreken Farm Cemetery (there is now only one) was begun by the 5th Dorset Regiment in June 1917 and used as a front line cemetery until April 1918. It contains 90 Commonwealth burials of the First World War and 14 German war graves. Thomas Henry Walters was awarded the Victory and British War Medals.